The Worlds Easiest CRM Install Wizard! Minutes matter. Zero BS CRM cuts the crap from day 1. The welcome wizard is a quick and slick way to get the CRM installed and ready to go. Sure you can dig further into the advanced settings after the 4 step CRM install, but that's genuinely optional! 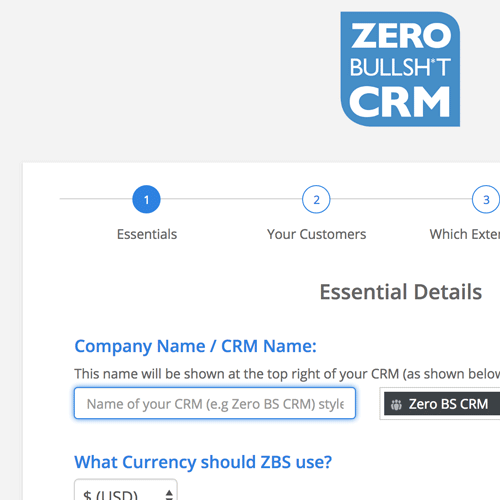 Zero BS CRM is truly the Entrepreneurs DIY CRM. Our entrepreneur users know what their time is worth and they go with our CRM because we equally understand the value of their time. We've refined our CRM again and again until it's as quick as possible. If you thought our welcome wizard was easy, try any of our CRM Extensions, (best way is to grab the bundle below) - e.g. Sync extensions need only login details, then they automatically sync all of your customers and transactions from the likes of PayPal, or Stripe!